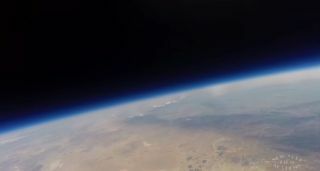 The view of Earth from the stratosphere as seen from a camera-equipped high-altitude balloon launched by students with the New York Film Academy – Los Angeles and led by professor Rajiv Uttamchandani. LOS ANGELES — When you think of the U.S. Air Force, the Federal Aviation Authority and the FBI, a team of starry-eyed film students may not necessarily come to mind as a potential partner for science. But bringing together a military branch, two government agencies and a team of university visual arts students is exactly what Rajiv Uttamchandani did this year. As a professor at the New York Film Academy - Los Angeles, Uttamchandani leads the school's STEAM Education Initiatives program to bring science and left-brain experiences to the generally right-brain crowd of film schools. While it can be exciting to see art students get motivated by science, Uttamchandani's latest experience this year may have resulted in a bit more excitement than even he expected. The relevant authorities agreed, and the combined 10.5-lb. payloads (4.7 kilograms) were prepared for a launch date in April. The effort was a partnership between California State University Northridge and the New York Film Academy. Why a film school, you might wonder? "Our primary goal from an instructional perspective was to engage visual arts students in science and project-based learning," Uttamchandani said as he described the project. "Here's what you want to do and this is what you want to accomplish … now how do you go about it?" "Even if the science return had been minimal, there is the powerful visual component," he said. "You have personally captured beautiful images of our planet, and you have ownership of them, and of the entire process of what it takes to capture these images. Our students found it quite engaging." Judith Morales, one of the academy's acting students, certainly did. "We need people to see what's happening with the Earth, and that we can do something about it," she said. "We were able to chronicle how natural vegetation in Tehachapi's mountain peaks have changed from past periods." "Southern California has been suffering from drought for the last few decades," Uttamchandani added. "Comparing infrared images to visible light images gave us an indication of how much moisture is contained within the natural vegetation, and through comparison of older satellite images; how it has changed over time across months or years, even decades." On April 20, the students traveled to the Mojave Desert with Uttamchandani, the faculty adviser on the project. They filled two giant latex balloons with helium, checked the recovery parachute, tracking devices, and, after the all electronics were powered up, let it go. Students with the New York Film Academy – Los Angeles launch a balloon to Earth's stratosphere as part of a STEAM Initiatives project to spur interest in science and engineering. The flight lasted almost three hours, with the team initially able to track the balloon's location via an onboard transmitter. "We purchased a special car-mounted antenna from Stratostar Systems to track the payload live," Uttamchandani said. "It was all very exciting, and the students enjoyed the thrill that accompanied us from liftoff to landing. They learned a lot about what it takes to do a project like this, and ultimately about what the scientific method really is." Once the balloon reached its maximum altitude, about 90,000 feet, or 17 miles (27,432 meters or 27 kilometers), it exploded and the payload's descent was controlled by a parachute. So far, all had gone according to plan. But where would it land? "We had a general idea of the wind patterns and courses the balloon might take," Uttamchandani said. "But there was no way to be certain where it would land." And that is how the FBI came to be involved. The high-altitude balloon carrying a small camera payload launched by New York Film Academy – Los Angeles students pops about 17 miles above Earth, beginning a parachute descent back to Earth's surface. "The FAA requires you to inform them with estimated altitude and ascent and descent rate of the balloon's flight," Uttamchandani said. "During the planning, prior to launch, it became obvious that it might come down inside of Edwards Air Force Base boundaries. So I communicated with them, and they said that was fine, so long as I was aware of the fact that we might not be able to get the hardware back if that did occur." And he thought that was that. It wasn't. "The very next day after that discussion, a couple of FBI agents visited me," Uttamchandani continued. "They were very cordial and the discussion was reasonable; basically, they just wanted to make sure that no classified images of Edwards from the air would get out. By the end of the discussion, we were in accord." When the balloon did finally land in the sun-blasted expanse of the Mojave, the student team could not find the science payload's signal. "It took a couple of hours, but we finally got the GPS signal back," said Kenneth Huitt, another NYFA acting student. "Once we tracked the location, we spread out in a line." They covered the likely territory like a forensics team. "Then we heard someone yell, 'We found it!'" Fortunately for the team, the balloon had landed well outside of Air Force property. It ultimately traveled more than 35 miles (56 km) from the launch site. The recorded imagery was spectacular. "Looking the video from the flight, you see how beautiful the Earth is … we got everything we expected, and more," Uttamchandani said. "You can clearly see the curvature of the Earth, the incredible colors of the horizon, and of course the visual data indicating changes in plant moisture." But beyond the quantifiable data gathered during the flight, it was the perspective of the students involved that evolved the most. "We can see global warming though our own experience, not just the experiences of others," said acting student Adam El Manawi. "We worked together, and it was a great experience for all of us." To see the team's film in its entirety, visit: https://www.youtube.com/watch?v=WAhfNuYoG_g&feature=youtu.be.